There is a Total Lunar Eclipse tonight visible of most of the US. You may want to watch it. The moon will likely appear strong red or orange, giving the name "blood moon". The Penumbral phase is weak and not easily seen so you may wish to observe it at other times. 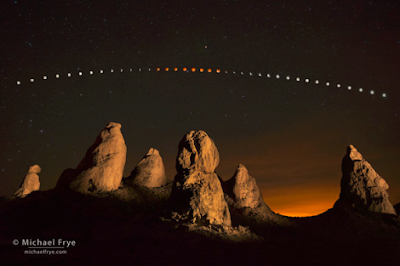 Photographer Michael Frye took a time series of the Lunar Eclipse Over the Trona Pinnacles last April. I missed that eclipse because it totally clouded up here. I will likely miss the one tonight because of clouds. If your mission is to photograph the the moon, see the above article and also his article Photographing the Lunar Eclipse. 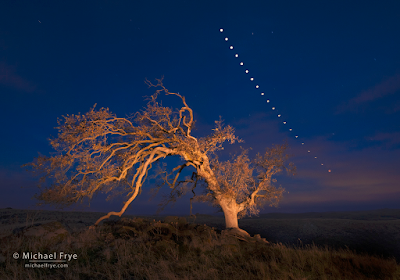 Michael Frye is one of the best, if not the best landscape photographer in the US. I highly recommend his PDF ebook Landscapes in Lightroom: The Essential Step-by-Step Guide. If you are a photographer using Lightroom, regardless of where you live, please do yourself a favor and get his book, recently updated to include new Lightroom 6 and Photoshop CC features including HDR Merge and the Panorama Merge.